It is FUCANCER Friday and what a week it has been. Technically on day 4 post op and I am feeling way better than expected. First, please excuse the following update as I am sure it will be littered with grammatical and spellling errorss however I am not apologising because the fact i am able to write this gives cause for celebration! So, as the Funny Boy implied everything didn’t go quite as planned – On account of me literally breaking free from a 3 point 60lb brace. According to my surgeon in 20 years he has only seen this achieved 3 times and I’m the first female. Admittedly this is not a title I had hoped for. I was really angry and disappointmed in myself when I found out – I wanted to play by the book and had rehearsed the steps in my mind in the days and hours leading up to the operation but the main thing is that my surgeon is happy if not a little amazed at my brute strength! The days here are highlighted with visits from family, friends and my number one sidekick Parsnip. So how am I feeling? I can hear a frequent clicking in my head which I’m told is the sound of my skull knitting itself back together. Every time I hear it I have an image of the grannies from the shreddies advert working away in there. The fantastic news is I can control my left hand side – Overall mobility is good but basic tasks like. Speaking, eating and brushing my teeth are challenging and require more brain power and concerted effort. I have reduced sensation on my left so response to temperature and my ability to grasp is slightly diminished but i am in no way complaining- for a first step I’m already higher than i expected to be. I’m very weak with a lop-sided smile and slurred speech but that will improve. Plus I have an awesome new scar! So initial thoughts from me…. the medical team here deserve the greatest gifts this earth has to offer – I have no idea how I am going to show my appreciation to Mr Liaquat, Sue, the many many, many nurses and all the therapists too. Mr Liaquat (my surgeon) is my new hero and at the next FUCancer event we will be cheering for him and his heroic team! I feel so incredibly lucky to be alive. The reality is now hitting me – rehab will require the 3 months advised. Speech therapy has begun and I’m working my way through tongue twisters I doubt I could have achieved even before Monday but I am looking forward… Looking forward to going home getting strong. Thanks for all the amazing messages and huge apologies for the less than coherent replies. Reviewing my sent items proves my brain is not working at its optimum! After being ill on Friday and an emergency visit to hospital we awoke on Monday morning with the very real prospect that surgery might not go ahead. We had been up late chatting and putting the finishing touches to the FUCancer playlist from all the suggestions Heather had. I spent most of the night adding in some Kiss and AC/DC to balance out the Britney and Kelly Clarkson tunes. I awoke at 5.30 am to the sound of the playlist up to 10 and Heather dancing around the room singing along, it’s moments like this, when you realise Cancer doesn’t stand a chance with this girl. It’s fair to say Parsnip was not happy with her mummy’s mood, burrowing under the duvet and refusing to come down for her breakfast. After showering and getting ready there was time for 30 minutes more dancing and singing before we left for the hospital at 6.30 am. Heather collected her post it note affirmations from the mirror and encouraged the whole family to adopt a superhero pose. A few more tracks from the playlist and we were at the hospital. We were about 45 minutes early and the walk we had planned to kill time was quickly abandoned on realising that the best summer weather ever had gone and it was absolutely minging out there. We then sat with a series of doctors who would be managing the surgery, going over the risks and confirming Heather’s consent. With each new doctor or nurse we had to explain Friday’s nightmare, knowing that this might mean the surgery would be cancelled. The decision was made to go ahead and it was time to say goodbye and although Heather didn’t have her cape and spandex she was ready for another city levelling super battle, as she was wheeled into surgery in her gown and slippers. With all the chat about Friday I had forgotten to mention to the staff that Heather was a real life super hero and that normal needles wouldn’t pierce her skin, special equipment would be required to operate on her and control her super strength. The NHS bill for Heather’s treatment in recent years was huge and has been priceless for us, thankfully they have never sent us an invoice for equipment damaged, while treating this super specimen. In similar fashion to Dr Banner, 4 years ago Heather was exposed to high levels of radiation, as treatment for her cancer. Unfortunately it doesn’t work like the movies and the result of this life saving treatment is years of side effects that impact your daily life. Thankfully for us Heather already had a hulking green monster inside her and anyone that knows her will agree “you won’t like her, when she’s hangry”. The last time they tried to strap her down for a procedure (Brachytherapy), she awoke to find stirrups bent out of recognition, apparently not designed for super thighs. On Monday they would be cutting a hole in her skull, exposing her brain, her head pinned into a brace with three prongs, held in place with 60 pounds of pressure. As I left the hospital my mind flashed back to the pre-op questions, “when did you last eat Heather”, “I had a biscuit at 9.30 last night” she replied. Panic hit my body, Heather now hadn’t eaten for over 12 hours and hanger would be setting in. There was no time to call Thor or ask Tony Stark to fly in his hulk buster, all I could do was pray that she could keep it under control. The day was a blur, spending time with family and trying to distract myself from the reality that whatever happened today, my life with Heather would be changing. I was expecting a call about 2.30 to say how she was, it didn’t come. I knew it could be later, but that didn’t lessen the worry, when the call didn’t arrive. I felt like I was having a panic attack and found myself wandering aimlessly trying to control my breathing. About 4.30 I got a call from the surgeon who had led Heather’s operation, his name isn’t Professor X or captain America, but he was the leader of a team avenging Heather against cancer. He told me that it had gone well and that she was moving her arm and leg, one of the biggest risks was damage to Heather’s motor strip and that she might lose use of the left side of her body. He repeated this a few times, before I clarified “both arms and legs?”, “Yes both” he replied. I was overjoyed, the NHS aka the Avengers had done an amazing job again, despite the challenges of operating on a super human….“BUT” Professor X stopped me in the middle of my 5th thank you speech and said “there was a slight problem”. When they woke Heather up, having earlier anaethetised her with a combination of gas, morphine and kryptonite. Sitting with her brain exposed and her skull pinned in place Heather came too with an empty belly. Her skin quickly turned from pale pink to deep green, her hospital gown bursting at the seams. Flexing her arms and legs and with one swift motion of her now bulging 23 inch green neck she broke free from her shackles. The Avengers jumped into action, Professor X covering her exposed brain to prevent the pins causing her serious injury, while Wonder Woman grabbed the equipment and quickly intubated Heather with a high dose of kryptonite, putting her back to sleep. The “awake craniotomy was off the cards, the carefully plotted out procedure couldn’t continue in the decimated city scape that surrounded them. The Avengers moved to plan B and pressed on with the operation. Professor X no longer had the feedback that an awake craniotomy provides and would need to use ultrasound and judgement to remove the tumour. As he relayed this story I felt slightly embarrassed to have earlier been on the verge of a panic attack, while waiting for a phone call. For Professor X and the Avengers there was no panic, there was calm and composure. At 5 pm we were allowed to visit Heather, as I walked in the room I saw my beautiful wife smiling back, looking better than she had done on Friday in St John’s hospital. She immediately began apologising for destroying a city scape during the operation. I could almost hear the sad piano music from the credits of the Incredible Hulk in the back ground, as he walked to another town regretting the destruction and chaos he had left behind. After apologising 50 times we received visits from Professor X, Wonder Woman, Captain Marvel and various other members of the NHS Avengers, all were happy with how the operation had gone. Heather spent the next hour slagging her dad and I, singing songs about “peeing freely” and telling constant jokes. Draped on the end of the bed was a red thin shiny piece of fabric. Heather had hung up he cape for now and along with the NHS Avengers she had earned a rest! However there was one more mission and I her trusty sidekick, would have to complete it alone. Was I up to the challenge? Could Penfold fill in for Dangermouse, could Robin star in a standalone movie without Batman? What would my mission be? “Seeing as I won’t be there, please can you sing Parsnip a song for me, when you get home?” This I could do, “What song?” I asked. She replied with a serious expression on her face, pausing for effect, such was the perilous nature of my task…“Nobody does it better by Carly Simon”. So if you hear a whining noise tonight, it’s not the cats on the wall outside. Look out your window and you might see a grown man slow dancing with a sausage dog murdering a great song, in the name of saying FU Cancer. You may have to excuse the lack of writing ability in this latest blog. That is because it’s coming to you from the one Heather refers to as “Funny Boy”. You might think that at least having earned this title you will be in for a humorous and entertaining read. Sadly Heather is the only person that has ever referred to me in this manner and I’m not even sure why. Possibly it might be the laughter I brought to an entire A & E staff after passing out and splitting my head open or perhaps it is a reference to the many times a day Heather jumps out on me and I jump out of my skin, which definitely amuses Heather. Anyway I don’t think any of this is a deliberate attempt at humour on my part. 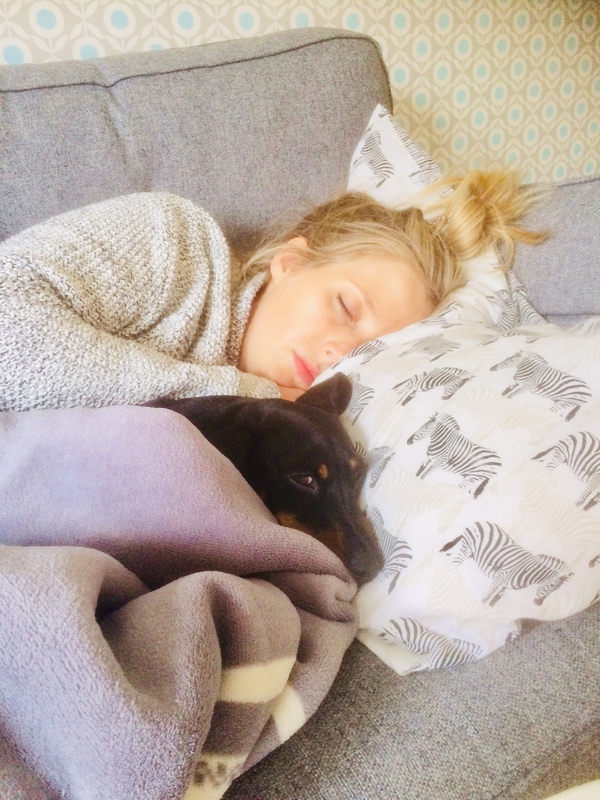 I am writing the blog today on strict instructions from Heather, as she is currently in hospital recovering from surgery to remove a tumour from her brain. 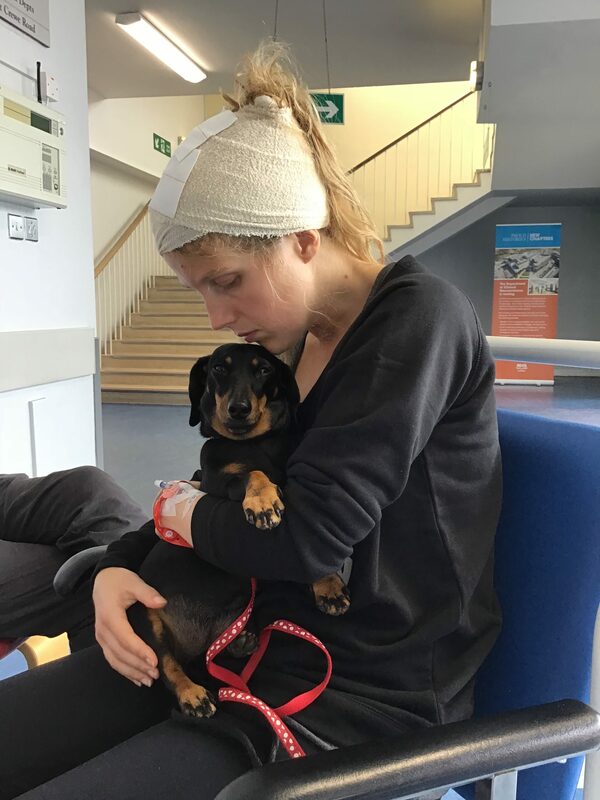 If you follow Heather’s blog, you will know that we had an overnight stay in hospital on Friday, after Heather was sick and had a seizure. While in hospital with her I witnessed something incredible that I wanted to share. Heather had been vomiting for about 9 hours by this point, it was now 5am and her hair was tied in a top knot and flowing out at the sides, like a strange pineapple with a blonde wig on top. There were bags under her eyes and her skin was pale and clammy. She had a dye patch test on her neck for eyelash tinting, which resembled a love bite that had gone septic. She was wearing a blue t-shirt, which was lightly flecked with yellow vomit from earlier in the night. The doctor entered the room and informed Heather of her latest mission, a CT scan to establish if this latest illness had been caused by changes in her tumour. Heather was helped from the bed and into a wheelchair. The nurse looked at Heather shivering and offered to place a blanket around her shoulders. She picked up a large red blanket and tied it at the neck, which draped round Heather’s shoulders and down to the floor. Combined with the blue t-shirt with yellow patches, it completed the look….Super Heather. She clenched a fist and pointed it in the above her, leaping out of the chair, jumping into the air and bursting through the ceiling tiles shouting “FU Cancer” as she flew away to the x-ray department. A few hours later the battle was won, we were home again and looking at Heather I cleared my eyes wondering if she had evolved into a super Dachshund/human hybrid. I realised she just had our sausage dog inside her t-shirt with her head poking out the top like a jack in the box. The hero had been reunited with her number one sidekick the Robin to her Batman. Heather has saved my world many times and I am grateful to be her number two sidekick (Alfred the butler) and to be part of this super team. You might know a hero like Heather, you might even be one yourself. If you’ve fought this terrible disease or supported someone who has, then you probably are. So if you ever look up at the skies in Scotland and wonder if it’s a bird, a plane or a blonde with a sausage dog, then it’s probably Super Heather! Actually speechless – I filmed this at 10am on the Sunday morning after STICK IT TO CANCER 2018! Huge thank you to all the volunteers, donors, players, spectators and everyone who has supported SITC this year. I frequently nag the Funny Boy for over-indulging in Sky Movies and Box Sets. He is a big fan of America’s Next Top Model whereas I couldn’t care less. I believe I could easily live without TV but, as he regularly reminds me, I am guilty of nurturing an addiction to social media. Anyone who follows my instagram will be all too familiar with pictures of Parsnip and I dare say anyone who is a friend on Facebook and Twitter will know what SITC stands for. For me social media is a necessary evil. It allows me to keep in touch with friends far and wide, it permits me to promote my fundraising plans and I am pretty sure it is how you (the person reading this now) has come to view my blog. It’s all promotion of some sort, and like many others I am very guilty of only portraying the bits I like. Take the most recent Festive Season for example. You’ll easily find the photo I shared of me on New Year’s Eve when I’m dressed to the nines with a full face of make up but you will struggle to find the pic of me on Christmas Day when I was fighting the flu. When I started this blog four years ago I described it as being a ‘brutally honest insight’ to what life is like living with and beyond cancer. Granted, I didn’t think I would be dealing with a second diagnosis but the sentiment remains: I want to be honest. It has been six weeks since I was diagnosed with a brain tumour. Although I continue to be very open with my words – I have carefully selected when to ‘vlog’. This has largely been dependant on when I have thought tentatively about what I want to share and timed to ensure I have mascara on and at least some decent lighting. It is all too easy to share the pictures when I am on top of the mountain or kayaking with a postcard-perfect view in the background but revealing the down days that #FUCANCER brings is a challenge. I don’t need pity or sympathy, nor do I seek it. But I do want to provide insight so hopefully people can understand the emotional roller coaster cancer takes you on. More importantly, I want it to provide hope to others who are facing a challenge. Be it cancer, mental health or whatever. You are not alone. So the vlog below is exactly what I hoped my blog would be: ‘brutally honest’! No make up, no notes, no agenda. Just exactly how I am feeling. A little scared, very vulnerable and unsure of what the future holds. Vlog #2 – A few highlights of saying FUCANCER whilst stuck in limbo. Feel free to send me your song suggestions! I met with the neurosurgeon on Wednesday. It was a very different experience than when I first met my oncologist. When I met my oncologist she was very direct and came to the appointment armed with a clear plan of how they intended to treat the tumour in my cervix. I was prepared for a similar style meeting – I had planned a list of questions largely focusing on treatment, side effects, timescales etc. But this appointment was very different. Any treatment – regardless of where it is targeted – comes with it’s own set of risks and repercussions. But it is only now I am beginning to fully appreciate how complex an organ the brain actually is. Treatment in such a delicate area and the side effects are all the more acute. A lot was discussed and it has been a huge amount to take in. The anti-seizure medication alone warrants its own set of side effects, one being ‘rage’ – not the best news for someone who’s nickname used to be Ragebox! (Watch out Funny Boy!) The situation is far from straight forward and each option has a range of potential risks and benefits. Decisions need to be made and in order for those to be thought through thoroughly more information is required. I struggle to decide what to wear on a day-to-day basis so this is going to be tough. For now we are taking time to do more tests, time to review our options and time to decide our plan of attack. My good friend put it best when she said ‘Cancer f*cks with everything’ and on this occasion I have an extended list of life admin as a result of my new diagnosis. I spent today drawing up a spidergram to help manage the tasks within my control. I feel completely unprepared for how life is going to change. I am trying hard to pre-empt and where possible minimise these changes but already I am feeling a loss of independence – the luxury of being able to drive wherever and whenever I want is something I definitely took for granted. My poor dad is definitely feeling the strain as chauffeur – not because he hates driving – because he can’t listen to the cricket when I’m in the car! I haven’t had a big emotional break down yet. Despite glassy eyes on several occasions I have managed to keep all tears at bay but this is not to be confused with me ‘putting a brave face on’! Believe me – I have the best support system who are actively waiting, encouraging, hoping I’ll cry! But the reality is it still doesn’t feel real and despite breaking the news to friends and family I don’t feel like this is happening to me. I don’t feel scared for what lies ahead I simply feel unprepared. It’s been one week now since I left hospital and I am not due to meet my neurosurgeon until the middle of next week. 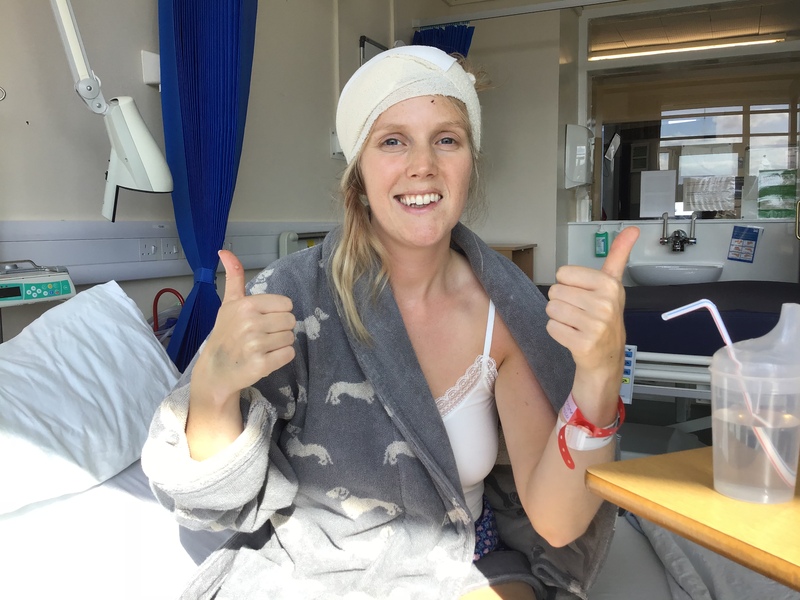 Excuse the pun but I still can’t get my head around it – I have a brain tumour! Even the fact I will be having an appointment with a neurosurgeon is something I thought I’d never have to say. The only neurosurgeon I’ve ever been interested in is Derek Shephard aka McDreamy! Fingers crossed my guy is as good as the fictitious character from Grey’s Anatomy. So what do you do when you receive devastating news and all you can do is wait? Well this is my second time dealing with this kind of news and I do think I have learnt from my previous experience. I would not wish it upon anyone but should you ever find yourself in a similar situation here are a few tips which have got me through the past week. I am so lucky to have a solid support system. For those who have followed my blog since my experience with cervical cancer you will be familiar with the top team of Iceberg, Buggernuts and the Funny Boy. 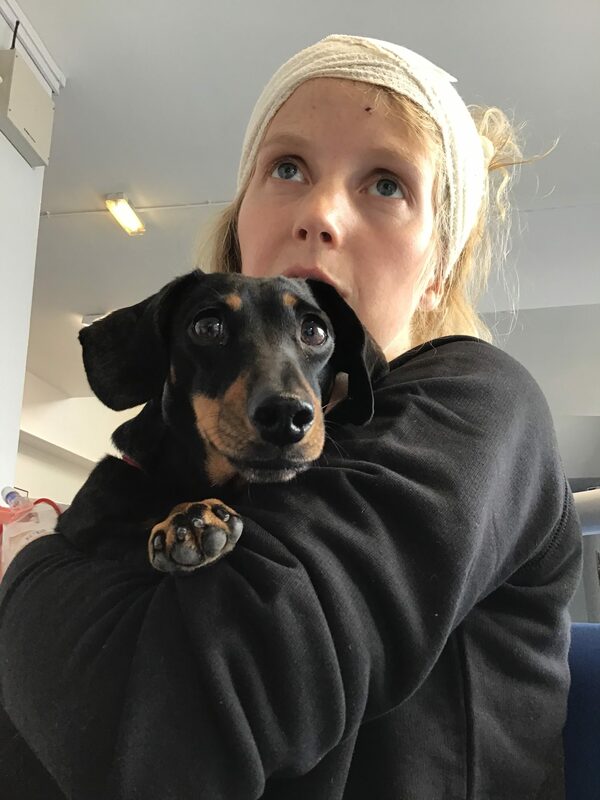 I’m delighted to say I have an additional side kick this time and that is my miniature dachshund Parsnip. Since being diagnosed she has barely left my side – even in hospital she came to visit me twice a day. This support system also includes my AMAZING friends who have driven across the country to be with me, took responsibility for breaking the news to others and even gifted me their final can of Irn Bru with the original recipe! So identify your support system, use them and remember like a good bra they are there to lift you up, make you look better and never leave you hanging! There are a lot of thoughts and emotions being processed. I am also experiencing major paranoia: ‘is it the fact I’m simply forgetting things due to stress or is it my brain tumour eating my memory? !’ The best thing to do is be selfish – or to put it another way – practise some self compassion. I know from experience how crappy cancer treatment can make you feel so in anticipation I have allowed myself to do the things that make me happy. For me this has largely included surrounding myself with friends and family, enjoying the sunshine, BBQs and kayaking! Lots of kayaking! Find what makes you happy and do it! I have been overwhelmed with messages from family and friends telling me I am strong – I will indulge my ego and agree. But being strong for me is knowing ‘it’s ok to not be ok’. For the large part of the last week I have felt upbeat – but there are moments when fear creeps in: When I wonder what the future holds. When I lie in bed scared to close my eyes in case I wake up to find a room full of paramedics again or worse. So how do I cope? I allow myself to feel those emotions and I talk about it. I confide in the Funny Boy, I prioritise a trip to Maggie’s and if necessary I have a little cry. Inevitably I always feel better after allowing myself to just be and letting off some steam. Anyone who knows me will tell you I am a planner. The weekend before my diagnosis I was updating my various calendars and realised I was not due to have a weekend free until the 14th July! As someone who loves my job this isn’t as intimidating as it might sound but it did highlight my work/life balance was maybe off-kilter. To go from jam-packed diary to being signed off work for at least a month is unnerving especially when it easy to allow negative thoughts of cancer to occupy your time. My remedy? Make plans for the short and long term. So next week the Funny Boy and I are booking that table at the restaurant we really like, we are having a spa day and – health permitting we are planning some day trips with Parsnip. Equally as important we have picked up some travel brochures and are planning our next overseas adventure! On that note – I hope you have some great plans for the bank holiday! Thanks for reading and as always #FUCANCER!